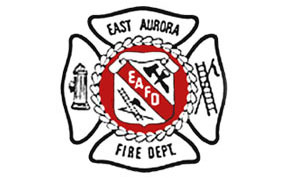 The first organizational meeting of the East Aurora Fire Department Auxiliary was held December 12, 1935 at a time when the four companies were housed around the area now known as East Aurora. This lead to the Auxiliary moving meetings and events between the four buildings; grateful were the gals when they could move into the “new” hall on Oakwood Avenue in 1954. By-laws were written and adopted January 13, 1936. At the time, to be eligible for membership, you had to be the wife, daughter, mother or sister of a fireman and over the age of 18. In 1993, by-laws were rewritten and adopted to include any person residing in East Aurora fire district. We have proudly provided support to our Fire Department whenever called upon; whether it be hands on assistance for their fund-raising at their carnivals, Ox Roast and current Food Truck events or preparing/delivering food, coffee/water during long battles with fire and other emergencies. Meals were prepared and served, not only to the firemen, but to those stranded during the ‘77 Blizzard. Today, we are still ready to provide such assistance. Like so many during the war years, we contributed time and money to the Red Cross, war bonds, and smokes for soldiers. Then and now, we have sponsored a child in the Appalachian area through Children, Inc. and contributed to many local organizations and charities. Fund-raising for these efforts has had a wide range from card parties, dinner dances, bingos and pot luck suppers in the very early years to fish fries, wedding catering, children’s halloween parties, Ox Roast concessions and vendor fairs. Meetings are held the second Monday during months of January thru June and September thru December at our new hall on Center Street. A social time featuring coffee/tea and snack begins at 7:00 PM with the business meeting called to order at 7:30 PM. We are seeking new members. Interested volunteers can call (716)462-7609 or (716)860-3689 for more information about applying to join.